31st Mar - Petersfield pupils, mums and grandmas made Mothering Sunday cards and brooches for all the ladies in the congregation when Bishop Stephen came to the Wimpole service. They were delighted to receive the special gifts and passed on their thanks to our children. 31st Mar - Don't forget the clocks change to BST today. School is open tomorrow (Monday) at the usual time. Please remember you'll need to be up an hour earlier than last week due to the clocks change! 29th Mar - Thank you to all the mothers and grandmothers who came into school to have lunch and work alongside the children in our Mothers in School afternoon. Beautiful brooches and sculptures were made and even a bug hotel! 29th Mar - Pine Class attended REactive church today thanks to Rev. Felicity and the church volunteers. 28th - Thank you to all the parents who have completed the Questionnaire and provided feedback at Parents' Evening. 27th Mar - Well done to Elm class who raised £33.86 for our Lent Challenge by making lemonade to sell. 27th Mar - Today is a day of fantastic costumes and drama workshops on Petersfield Book Day. 26th Mar - Parents' Evening at Petersfield - a chance to celebrate pupil success and discuss next steps together. 26th - Yew Class learnt about Easter at REactive church today. 22nd Mar - Mr Hollands was delighted to give The Hollands' Cup Achievement in Music Award to a child for her commitment to learning to play the recorder, using notation and being so enthusiastic! children received prizes for team work and honesty. Well done! 18th Mar - Back by popular demand, every class participated in the Young'uns workshops as the award winning folk band return to perform, share tales, educate and entertain. British values, history, oracy, team work and music combined and resulted in a school chant recorded by all our KS2 pupils. 15th Mar - Well done to the pupils who received a Headteacher Award today, we are proud of your achievements. 14th Mar - We welcomed Mrs Gibson into school to talk in assembly about her experiences of her childhood and school days. We listened intently to tales about her visit to London to see the coronation celebrations as a young schoolgirl. 13th Mar - Well done to Pine class for the delicious cakes and the excellent fundraising for FOPS as a result of selling them. 8th Mar - Elm Class showcased their learning in their class assembly this morning. We heard stories, had a weather report complete with hand held auto-cue, sang songs and all joined in the dancing. It was an uplifting experience for all! 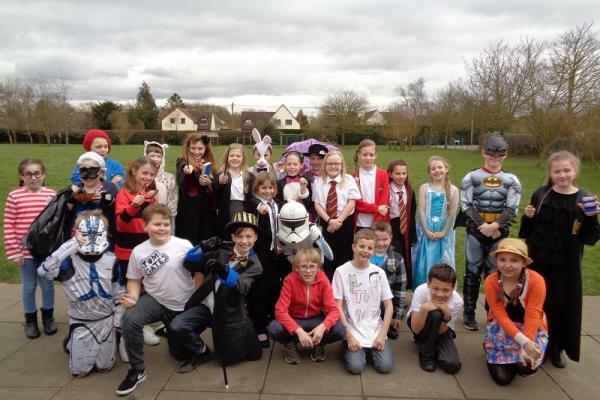 7th Mar - On World Book Day, pupils from the classes who were not on a visit dressed as their favourite characters. Petersfield Book Day will be held later in the term when all children are in school. 7th Mar - Rowan and Yew classes learnt much new information when they went to the Museum of Anthropology and Archaeology and the Fitzwilliam Museum. It was a wonderful opportunity to see and handle the Mayan objects. 6th Mar - We were joined by Vivien Beck, a representative from Age Concern UK. She spoke about older people and their needs. Our children showed great empathy and Mrs Beck commented on how 'incredibly well-behaved' the children were. Age Concern UK is our 'Bishop Stephen's Lent Challenge' charity. 1st Mar - We welcomed parents and governors for the celebration of half term learning. As always, we were impressed by the creativity and diversity of the work. Our pupils were able to demonstrate their oracy skills, as they explained their learning to others or asked questions about it. 27th Feb - Thanks to FOPS and school staff for the fun, fundraising disco tonight. 25th Feb - We hope everyone had a lovely half term holiday! Welcome back! School is now open for the second half of the Spring Term. 15th Feb - Congratulations to our Holland's Cup winner for demonstrating her musical skills this term. 12th Feb - Well done year 6! Your enthusiasm, questioning skills and enjoyment of the text were a credit to you during the first early morning booster session today. 8th Feb - Today we were joined by our Health and Safety Governor for a meeting with our representatives, followed by a Health and Safety walk around the school site. Together, we worked to identify any Health and Safety issues. 7th Feb - As part of their topic work, Pine class visited Flag Fen today. This was a fantastic opportunity and will support their further learning back in the classroom. 7th Feb - In their class assembly, we were delighted to see all the learning the pupils in Rowan class have achieved this term. The Mayan headdresses and painted faces were very effective! 5th Feb - E-Safety Day - 'We have learnt that there are many websites and organisations which might ask us to give them permission to use our personal data and what we should do to keep our date safe'. 1st Feb - We were delighted to welcome our EDRA into school today. She visited each class, celebrating the work on show and commented on how she could see the positive impact of our oracy work. 31st Jan - Our KS1 children joined in our E-Safety workshops, learning interactively how to stay safe online. They learnt that we do not always know who we are messaging and we must not share our details online. 30th Jan - Thank you to the parents who joined us to enjoy and join in with the reprise of the O2 performance today. 29th Jan - Year 5 and 6 participated in the amazing O2 Young Voices performance with 1000s of other children. Our pupils' behavior was outstanding. We are very proud of them and appreciate the parent helpers and staff team who made this possible. 28th Jan - Thanks to the catering staff, MSAs and pupils, today's new lunchtime choice system worked very well. Pupils now choose their lunch main meal in the morning, resulting in everyone getting their first choice and significantly less wastage. 25th Jan - We are so proud of our year 4 pupils who represented us at the Maths Challenge held in Cambridge this afternoon. They conducted themselves very well and used their maths strategies, oracy and collaborative skills to find the answers. A big thank you to Mrs Anderson for transporting them. 22nd Jan - It was great to share stories with pupils this morning as parents joined us for our weekly reading cafe in EYFS and KS1. 18th Jan - Yew class demonstrated their acting and oracy skills through their dramatic presentation in their class assembly this morning. The audience were impressed to see how they could present the poem about cliff erosion in such a powerful way. 16th Jan - Ash and Elm class had really enjoyed playing with a range of toys, searching for clues as archaeologists and then making their own toys as part of the history topic experience day. 14th Jan - Our thanks to Gog Magog Molly for teaching Pine and Rowan classes two traditional and local dances to perform to the school on Plough Monday. 11th Jan - Our pupils are really excited to be working on their fluency and tables in maths. They have been challenging themselves on the computers to see how fast their mental recall of tables is. 4th Jan - We are focusing on handwriting and sentence punctuation this week. Our pupils can now enthusiastically articulate how they are improving their own work. 3rd Jan - Happy New Year! Welcome back as school opens for the Spring term. 19th Dec - School is now closed for the festive season. Merry Christmas! We very much look forward to welcoming pupils, parents and visitors back to school on Thursday 3rd January 2019. 19th Dec - Father Christmas joined us for our Christmas parties today and gave out gifts to the children. Ho Ho Ho! 19th Dec - Thank you to Rev Felicity for the Christmas service today. Our reception pupils were outstanding as they acted out the Nativity. 18th Dec - Thanks to the catering staff for a delicious Christmas dinner and to FOPS for the Christmas crackers. 14th Dec - We had a real treat, this afternoon, watching Divergent Drama's 'Cinderyeller'. Our pupils said: 'It was wonderful. When I grow up, I want to be an actor like them' and 'It inspired me to think that I might write a play'. Thank you to FOPS for providing the funds for this. 14th Dec - Two Governors visited school to discuss children's extended writing which is one of our school priorities. The pupils were able to talk about their learning using their oracy skills and share their learning in their books. 13th Dec - The final EYFS and KS1 performance was the very best! Wow! 12th Dec - The carols under the tree in Wimpole Stables were fabulous tonight. Thanks to Sandra at Wimpole, all those who attended - especially the children on the instruments - and to FOPS for the warm minced pies. 12th Dec - Thank you to all the parents and supporters who enjoyed the EYFS and KS1 performance today. We all agree it was fantastic! 12th Dec - Rowan class attended REActive Church today. Thank you so much to Rev Felicity and the volunteers for this season's sessions. 11th Dec - Elm and Ash class, your dress rehearsal was fantastic! Thank you for Mother Goose who joined us for this performance. for playing and for the display of Christmas trees, the train and lights. and had a quiz on Roman numerals. 6th Dec - Today, Pine class enjoyed REActive Church. 5th Dec - GenR8 are visiting today to tell the Christmas story. 5th Dec - Thanks to Mrs Bonfield and our creative pupils, we now have a beautiful, hand made advent calendar in the hall. 4th Dec - Yew class attended REActive Church today as we prepare for Christmas. 3rd Dec - Thanks to FOPS for bringing that Christmas feel to Petersfield today with all the Christmas decorations. Don't forget the bauble competition to decorate the tree. Due Monday 17th December. 1st Dec - Join us today, 10am to 4pm, for the wonderful FOPS Christmas Fair. Christmas trees, Father Christmas, amazing stalls and delicious food are all available at the Lordsbridge Arena. 30th Nov - The Christingle was a beautiful service at church, the children looked in awe and wonder at the reflections from the light of the candle flames. 29th Nov - Following help from a large number of parents today, we now have our Christingles ready for tomorrow's church service. 23rd Nov - We were again delighted to welcome our EYFS parents into school today to share a lunch with our youngest pupils. 23rd Nov - Our pupils shared what they had learnt in Road Safety week. The youngest pupils told us to stop, listen and think and Elm class shared these words in Spanish. KS2 completed a traffic survey, discussed the pros and cons of walking home alone and discussed road safety. 22nd Nov - Well done to all the KS2 cross country runners who participated in the event today. We were impressed by your perseverance. 21st Nov - We were delighted to welcome so many parents, grandparents and children to our 'Stay and Play' today in preparation for reception 2019. 20th Nov - Thanks to all the parent volunteers and staff for a fantastic disco tonight. A great time was had by all! 20th Nov - Thanks to the EYFS parents who joined their children for lunch today. The children really enjoyed it and we were pleased to receive all the positive comments about the new lunches. 16th Nov - For the first time, the BFP partnership schools (Barrington, Foxton and Petersfield) brought all the classes together for an AMAZING morning of Oracy. Behaviour was outstanding and our children enjoyed meeting new friends and working with others they already know from outside school. 16th Nov - In response to the Oracy Day, pupils said: 'It's amazing how detailed the stories were', 'They were all different, some we listened to, others we watched' and 'It was incredible some little kids mde up stories I would never have dreamt of'. 15th Nov - In the Anti-Bullying celebration of learning, we thought about respect. Ash class talked about being a good friend, Elm class retold the Willy the Wimp story. Pine class were inspired by Mark Rothko and painted their emotions. Rowan and Yew classes responded to poetry about bullying. 13th Nov - We continue to hold a 'Meet the SENDCo' drop in session for parents regularly. The session, like this morning, is for any parents who would like to ask any questions about supporting any additional needs in school. 11th Nov - We are honored to continue our longstanding relationship with the Royal British Legion and today attended the Remembrance Service in Croydon and the Orwell centenary roll call. We will remember them. 9th Nov - We were joined by Mr Bob Bryant today to talk about Remembrance. He unveiled a wall hanging made by the children and designed by Mrs Bonfield to mark the centenary. 8th Nov - We have our own WW1 soldier in the hall, thanks to Mr Bush, who has put a wonderful display of WW1 memorabilia. 6th Nov - Well done to the 8 pupils who represented us at the orienteering competition and said 'This is so much fun! ', 'Can we come again?'. They behaved wonderfully and worked well together as a team to increase their effectiveness following different styles of maps to complete the challenges. 4th Nov - We were delighted to contribute to and attend the Remembrance Concert and Display. Our pupils have hand sewn and printed our remembrance wall hanging which was on display. 2nd Nov - 'Stunning!' and 'What an amazing display...as always' were just 2 of the many, many comments following the outstanding fireworks display this evening. Thank you to Mr Gwynn and his team, to FOPS and for the amazing community support which made Fireworks at Petersfield so special. 2nd Nov - Celebration of Learning - The fabulous range of homework projects shared with parents, pupils and staff was further enhanced by our pupils showcasing the oracy skills we have been learning. 30th Oct - Welcome back as school re-opens to pupils, parents and visitors for an exciting and busy second autumn half term of learning. 29th Oct - Thanks to Voice 21 and our BFP partnership for a great INSET day training to further develop out Oracy work in school. 19th Oct - School is now closed for half term. However, holiday sports clubs are running throughout the holiday week. Monday 29th is a staff INSET training day so school will reopen for the new term to pupils, parents and visitors on Tuesday 30th Oct. Happy half term! 19th Oct - Mr Hollands presented the Hollands' Cup to Thomas for his musicality and love of music. He also gave us a treat by dancing for us! 19th Oct - Well done Petersfield, we raised £104.64 for the Shine charity. It was delightful to see all the children dressed in yellow. This money will really make a difference to families in Cambridgeshire. 19th Oct - We enjoyed a wonderful Black History assembly. Children presented work inspired by: Frank Bowling, Chris Ofili, Lublin Himid, Uno Egonu and Hurvin Anderson. The children's work was so good that it was difficult to see the difference between the artist and the children's. 15th Oct - The Lunchtime Company, new lunch providers as of today, received rave reviews from pupils and staff who commented on the amazing taste, delicious smell the moment you entered the dining hall and the significant improvement in the school meals today. 15th Oct - School started with much excitement in assembly as our Story Teller challenged our understanding of stories. Each class is participating in an exciting workshop in preparation for sharing stories with children from Barrington and Foxton school after half term. 12th Oct - Well done to Yew class for their delicious FOPS cake sale fundraiser. 8th-12th Oct - Thank you to our amazing careers' week parent volunteers. Our pupils said: 'fascinating, we didn't know how many jobs there are in the world, quite exciting listening to the people, incredible to hear about the jobs, interesting to hear what other people do for work, and inspiring!'. 10th Oct - We were delighted to welcome The Lunchtime Company into school to tell us all about the exciting and tasty new menu for school meals from October 15th. 8th Oct - Welcome to our PGCE students working in Ash Class. 8th Oct - Our careers week is already inspiring conversations about 'What I am going to be when I grow up' thanks to our talks today on careers in epidemiology, working with wildlife and being a human rights lawyer. Many thanks to out inspirational volunteers. 5th Oct - Our year 6 pupils visited Ely Cathedral today, along with 600 pupils from schools in the Diocese. Their focus was WW1 and what life was like at the Home Front. It ended with poppies falling in the octagon. 'It was so beautiful'. 'I loved looking up and seeing the falling poppies'. 5th Oct - As today was World Smile Day, in Collective Worship we discussed the importance of smiles and how it makes you and others feel when you smile. We asked our pupils to go home and give their families a big smile! 5th Oct - It was wonderful to hear our cook praise the whole of Rowan class for their polite manners today. She said that every child thanked her and was so polite. She said that in all the schools she has worked in, she has never had a whole class do that before. 3rd Oct - We are really focusing on our learning behaviours in school and went through this together in assembly. After reading the children's comments in their behaviour questionnaires, we have amended our plans including how we sit in assembly. 28th Sept - Well done to our first Headteachers' Award winners of 2018-19. What a good example to set to others. 28th Sept - Our pupils were delighted, excited and inspired by Jamie, who came from Rocksteady Music School to work with our pupils. They said: 'I want a band of my own when I get older!' and 'It was fun playing the electric guitar'. 28th Sept - Thank you to all who supported our Macmillan Coffee morning and cake sale today. We raised £160 for this worthwhile charity. 27th Sept - Rowan and Yew classes enjoyed a busy day explored Wicken Fen as part of their curriculum topic. 21st Sept - We went to church today to celebrate and give thanks for harvest. The children donated food and money to the Royston Food Bank. Our children read the prayers they had written in buddy groups. 20th Sept - The primary focus of our first Full Governing Body meeting of the academic year was on our Petersfield Priorities to further raise standards. Please do see how you can help your child by reading the weekly update on the newsletter. 20th Sept - Our Playleaders received training to support them in their role at breaks and lunchtimes. 14th Sept - Congratulations to our EYFS who are now in school full time. We are very proud of your smooth transition to school. 14th Sept - Well done to our Peer Mediators who produced a role play to illustrate their function. They successfully demonstrated how powerful Peer Mediators can be in supporting their peers. 13th - Thanks again to the parents who attended the second set of curriculum sessions. You should now have a pack of important paperwork to check, complete, sign and return. Please contact the school if you have not yet received this and return it promptly. 13th Sept - Today, we welcomed into school Nina, our new playtherapist from the YMCA. 12th Sept - Following the first meeting of the year, our thanks go to FOPS (Friends of Petersfield, our PTA) for their tireless work to raise funds for the school. Do look at the FOPS page on our website if you want to find out more or volunteer to help. 11th Sept - Thank you to the parents who attended our curriculum sessions today to find out the 2018-19 academic year in Yew and Elm class. 11th Sept - Welcome back to Mr Hollands and Rev. Felicity who led our Collective Worship today. 11th Sept - Well done to our EYFS pupils who attended school at lunchtime for the first time! 10th Sept - In our first 'Buddy Group' Collective Worship, we used our Oracy skills to write prayers for harvest. 7th Sept - We are very proud of all our new reception pupils who have started school over the last 2 days. 6th Sept - Welcome back to the academic year 18-19. 24th July - School is now closed for the summer. Best wishes for a safe, happy and fun summer to all our community. We look forward to opening the doors to pupils, parents and visitors on Thursday 6th September 2018. 24th July - Our very best wishes to Miss Smith, Mr Ashford and Mrs Johnson as they leave our school today. Pupils spoke of these teachers' successes in our Staff Leavers' Assembly. 24th July - Welcome to Miss Way who joined us for our transition day as all our pupils moved to their new classes. 23rd July - Cambridge water have confirmed that the water supply has been restored and the pressure should return to normal by the end of the day. School will be open on Tuesday 24th July for the last day of term. 20th July - Yr 6, you are truly incredible! Never stop aiming high and being great friends. It's been a privilege to watch you fly so high at Petersfield. Tears of happiness at amazing memories are treasures. Good luck to you and your family who joined us for the wonderful Leavers' Assembly. 20th July - Pine class attended REactive church and said 'It was fun, as we got to do lots of different activities', 'I enjoyed learning all about Jesus' and 'We were able to use our acting skills and get involved in what we were learning'. 19th July - Our FGB started with a Parents' Forum where we welcome parents to 'meet the governors'. 19th July - Exciting times! We welcomed our new EYFS for 2018 for the first of their three transition visits over the next week. 18th - Our thanks go to Rev Julie Norris for leading a lovely leavers' service at church. 17th July - Thank you to all the parents who joined us for our open afternoon and certificate presentation and year 6 leavers' tea party. 16th July - Today's school reports provided the opportunity to say 'Well done!' to pupils and staff for a year of hard work. 16th July - Dress in bright colours day raised over £70 for our playworker to take to Africa for her charity work this summer. Well done Petersfield! 13th July - Congratulations to our Hollands' cup winner for his use of his voice both in and out of school to great effect. 11th July - The FOPS AGM today was an opportunity to say thanks to FOPS members and the committee for their amazing hard work this year, to welcome volunteers for next year and to plan for the future - including the ground work day next Tuesday. Can you spare half an hour to help from 3:30pm? 11th July - Yew class visited church for REactive church today. 9th July - What an fantastic visit for Rowan and Yew. The Tower of London trip was linked to the topic and the recent Darwin Rocks production. 6th July - What an amazing day at Wimbledon for the year 5 and 6 pupils following our recent tennis coaching. Thank you to Ms Catchpole and Mrs Peachey for enabling a very busy, exciting and memorable day in London. 5th and 6th July - Our year 6s, who are moving onto CVC in September, took part in their 'Move up' days. 5th and 6th July - Year 5 enjoyed their taster secondary experience at BVC. 4th July - We given another amazing performance tonight of 'Darwin Rocks!'. One of the songs was 'Nothing beats being you!'. This message is very important, as they demonstrated in song, dance and acting. 3rd July - Wow! The singing, solos, dancing, props, costumes, acting and oracy at the dress rehearsal and evening performance were incredible. We are looking forward to tomorrow's performance. 2nd July - Thank you to Ash class for the excellent refreshments at the FOPS cake sale. 29th June - Ash and Elm classes enjoyed their visit to Woburn Safari Park seeing many animals up close. These included the spider monkey enclosure and giraffes and lions in the grasslands. They also learnt from a talk about habitats, saw a giant stick insect and felt various pelts. 28th June - Well done to our year 3 pupils who represented us so well at the cricket festival and competition. 28th June - Well done to all those who took part in the run before school. Thank you again to Wendy Randall for organizing this with England Athletics and Run Together. 27th June - The FOPS committee met. The AGM is booked for the 11th July straight after school. Please do join us for this meeting. 27th June - From storytelling to radio adverts, our Oracy Presentation Day showcased all the oracy skills we have been learning since January. Well done to each class who presented and our Governors for attending the event! Keep practicing these skills over the summer! 26th June - Thank you your for your support and communication as we all worked together to deal with the challenge of the closed road. 26th June - Today we welcomes two governors into school to monitor the specific areas of maths and pupil premium use. Please read their report on the good progress and how you can further support your child at home in the school newsletter this week. 25th June - Mrs Peachey and Mrs Squires begun home visits for the new 2018 reception. Thank you for being so welcoming! 24th June - WOW! What an incredible inaugural Run Orwell. Thank you to the runners and the community, and of course FOPS, for this spectacular event which was so inspiring as people tried their best, supported others and had fun! 21st June - We were delighted to welcome parents and carers of our new 2018 EYFS children to our 'New Intake' evening tonight. 21st June - Year 5 really enjoyed participating in the Tag Rugby competition and festival at Cambridge Rugby Club. The team won the 'Spirit of the Games' award for demonstrating good sportsmanship throughout the event, even when decisions didn't go their way. 20th June - We are looking forward to the next phase of transition as BVC visit our year 6s tonight. 20th June - Today, we were delighted to welcome Mother Goose's rising fives into school as part of their transition to school. 19th June - After an informative day of staff training on Monday, school is open to pupils, #parents and visitors on Tuesday 19th June. 18th June - Monday: school is closed to pupils and parents as all staff will be attending training. We look forward to Tuesday 19th when pupils will resume learning in school. 15th June - We enjoyed a very productive afternoon with dads, granddads and male carers participating in artwork with the children. Before this in an assembly, the children were given the opportunity to these special people for all they do for them. 11th June - Today, our pupils were inspired by the Young'Uns: an English folk group who previously won the BBC Radio 2 Folk Awards 'Best Group' award. Specialising in singing unaccompanied, they worked with all of KS2 to bring history to life, sing, move and perform. Wow! 11th June - the Bikeability instructors started this week's sessions with a bike check and skills session. Thank you to parents for getting the bikes to school so pupils can learn these vital life skills. 8th June - Norwich FC came in for the first of a series of sessions. The pupil's summarised these enjoyable and educational sessions by saying: 'They come in to improve our PE skills; strength, ability and speed'. 8th June - Elm class began the whole school summer program of tennis coaching. Pupils reported: 'I enjoyed doing the catching and throwing' and 'I really enjoyed passing to my partner even though it was tricky. I want to do it again.' The coach complemented our pupils on their listening skills. 8th June - This morning, our Celebration of Learning event, for the half term homework projects, showcased our oracy skills as pupils and parents shared their learning. Our pupils said: 'There was lots going on and you could share your learning with your friends' and 'It was very worthwhile'. 7th June - Well done to our quad kids who represented the school today at this sporting event. 7th June - We're swimming! We are delighted that the pool is up and running for the swimming season. This announcement was greeted with much excitement from the children! 6th June - always a highlight, GenR8 visited school for Collective Worship today. The theme of God's masterpiece was explored. 6th June - Thank you to the pupils and staff for a wonderful residential visit. Our pupils said: 'It reunites you with your friends and makes a stronger bond.' and 'I enjoyed Jacob's ladder because it was great seeing how far you could get!'. 6th June - Kingswood update: after a fabulous visit, we are expecting a return time of 3:45pm. 6th June - Kingswood morning update: a good night's sleep, beds stripped and they're off to climbing and nightline this morning. We expect them back by the end of the school day but will update the website as they leave and travel if this changes. 5th June - Kingswood evening update: after exploring rock pools and making sandcastle volcanoes, tonight's fun activity was a disco! Hot chocolate has been consumed and now they are all in bed! 5th June - Kingswood early evening update: after activities designed to develop team work, resilience and communication skills, this afternoon our Kingswood adventurers enjoyed beach activities. 5th June - Kingswood lunchtime update: fun activities today include Jacob's ladder and fencing. 5th June - Kingswood morning update: a good night's sleep. Children and staff are looking forward to a cooked breakfast with generous portions before a day packed with activities! 4th June - Kingswood evening update: after an exciting evening and hot chocolate, everyone is in bed! Some are sleepy. Some not so sleepy! 4th June - Kingswood early evening update: after a 'really yummy' dinner, the evening activity is mini olympics. 4th June - Kingswood 4:30pm update: archery and den building this afternoon. Staff are very proud of our pupils who are very happy and enjoying new experiences. 4th June - Our Kingswood party have arrived and have already started go-karting, zipwire and aeroball. They will be ready for their lunch! 4th June - An early start for Kingswood pupils! We look forward to regular updates about your exciting adventure this week! 4th June - School is open! Welcome back to pupils, parents and visitors for our last half term of the 2017-18 academic year! 25th May - School is now closed for half term. We wish you a happy half term holidays! We look forward to welcoming pupils, parents and visitors back to school on Monday 4th June. 25th May - A moment of awe and wonder was evident today as Ash class released their butterfly. They have watched it transform and hatch from a cocoon throughout the half term. The discussion this inspired was remarkable. 25th May - Well done to all those who received their certificates in today's Headteachers' Awards assembly. We were particularly proud of our Mathletics gold certificates winners! 25th May - Congratulations to Alice for her enthusiasm and duet playing. She was a worthy winner of the Hollands' Cup today. 23rd May - Well done to our year 2 pupils who today completed their final SATS test. They worked very hard and we are very proud of them! 17th May - Four year 6 pupils did an excellent job (especially as it was just hours after their last maths SAT!) representing Petersfield at the St Faiths' Maths Challenge. Our thanks go to Mrs Anderson for leading this visit. 17th May - Well done year 6, you completed the final SATs test today and remained a credit to yourself and the school throughout the tests. The beautifully iced cakes were very well deserved! 16th Mar - We were delighted to be joined by Mrs Jane Johnson, one of our school governors, in assembly today. She spoke to the children about the importance of reading and told them the results of the recent Governor Reading questionnaire. 14th May - What an incredible year 6! We are so proud of how you have tackled this week's SATS! Keep it up all week, year 6. Well done! 8th May - With the swimming season nearly upon us (much to the delight of our pupils!) staff attended our annual first aid and resuscitation training in preparation for swimming. 8th May - Year 5 representatives attended a creative writing masterclass at BVC where they took part in a variety of fun activities focused on generating story ideas before writing a short story and reading it aloud. 7th May - Happy May Bank Holiday! Puffins is open from 7:45am, as normal, on Tuesday 8th May. 4th May - What a fantastic assembly Ash class! Thank you for the positive feedback from parents including 'such a lovely assembly, wish school was like that in my day'! 3rd May - Well done to our Year 5 maths competition competitors who were praised for their team work. Thank you to Mrs Anderson for organising attendance at this event. 2nd May - Thank you to Ute for leading the Book Club assembly. Ute, our local published author, runs 2 lunchtime clubs a week to inspire young writers. 1st May - Fabulous cakes were on display and sold by our very eager Elm class. Thank you for supporting this event to raise funds for FOPS. 27th Apr - An emotional Collective Worship was held to thank Mr Hollands' for his VERY longstanding support of our school. Among the pupil comments were 'thank you for playing in church', 'thank you for being part of our school family' and 'I will always remember you for playing the piano'. 26th Apr - Mrs Peachey, our Sports lead, organised for our runners to attend the Cross County competition in St Neots after school. We were very proud of their effort, the response of those who were competing for the first time and the 1st place! Well done! 25th Apr - As our Walk to School week finished with the highest number of participants today, we awarded certificates to all those who had taken part. 25th Apr - Ash class explored, created and marveled in their first Forest Schools session today. 25th Apr - Pine class visited the Fitzwilliam Museum today to compare their skills mummifying a tomato to the Egyptian mummies on display! 24th Apr - Congratulations to all those who took part in the Cross Country event today. Our results included a 1st, 3rd and 4th! 23rd Apr - Curriculum Maps, Homework Menus and Oracy Information and Guidance for Parents has been sent home in your child's Learning Link. 20th Apr - Mrs Gwynn met with the Peer Mediation councillors today and was delighted with their attitude. Why do they want to be a peer mediator? Replies included 'Because I want to make people happy','I want to make our school a happier place' and 'I want to make a difference'. 20th Apr - Excellent, over a third of pupils walked to school today during 'Walk to School' week. With 3 days to go, more pupils can now join us for the morning exercise as part of our travel plan. 19th Apr - Well done to all those who joined us for the start of Walk to School Week. Please do join us at each morning until Wednesday 25th to 'Walk to School'. 18th April - Following the exciting Archeological Dig on our school site two years ago, the team returned today to geophys the area in an attempt to explain the stone found in the test pits. We eagerly await the results! 16th Mar - Today is 'Offer day' for pupils due to start at Petersfield in September 2018. Please do contact school to accept your place. We very much look forward to welcoming our new pupils and parents to our school family. 16th Mar - Excitingly, our sensory garden is taking shape thanks to FOPs, Tesco tokens, the Community Chest grant and the work so far by Meadow Nursery. We look forward to seeing this garden evolve and grow over the coming weeks. 16th Apr - Welcome back to pupils, parents and visitors as school opens today for the start of the exciting and busy summer term. 29th Mar - School is now closed for the Easter holiday. We look forward to welcoming pupils, parents and visitors back to school on Monday 16th April. Happy Easter! 29th Mar - Today we welcomed our Diocese Advisor into school. She spoke to pupils about the Collective Worship which they are increasingly leading. They explained about our 'school family' the benefit of 'time for reflection' and how 'it is fun now, we get involved'. 28th Mar - Thank you to the parents who joined us for the phonics training session this afternoon. Two of our school governors also attended this session as part of their monitoring of reading across the school. 28th Mar - Thank you to Revd Felicity for leading our church service at St Andrew's this morning. As we enjoy our chocolate Easter eggs on Sunday, we have been tasked with reflecting on God's love and the love of the special people in our lives, including those who give us these tasty eggs! 26th Mar - As we are an inclusive school, Mrs Gwynn attended excellent Stonewall equality training today. 26th Mar - To launch Autism Awareness Week, Miss Smith led Collective Worship. 23rd Mar - Today was the final day of our Sports Relief Fundraising daily mile. After a week of fun and fitness, please do return your sponsorship forms for this great cause. Our pupils said 'I love running', 'I can feel my heart beating fast' and 'running makes you fitter'! 23rd Mar - It was inspirational to see the KS2 Streetdancers perform their routine in Headteachers' Assembly today. They danced with enthusiasm, agility and lots of pom-poms! 23rd Mar - Congratulations to our Holland's cup and Headteachers' Awards winners. We were please to welcome Mr Hollands who presented the Holland's Cup to a child who plays both the piano and trumpet, she was delighted and surprised to receive this award. 22nd Mar - Well done to our KS1 performers who showcased their dancing after school today. The positive feedback included: 'they were really good', 'they had big smiles throughout' and 'lovely skipping in time to the music'. 22nd Mar - Rowan and Yew class enjoyed a fantastic day out at the National Space Centre, linked to their current topic. Pupils said 'It was really interesting to learn more about Space than we ever imagined possible' and 'the Planetarium was really cool, it was like flying through the Universe'. 22nd March - Ash and Elm classes visited Ickworth as part of their curriculum topic. The children had a wonderful time and reported: 'It was great', 'We walked a really long way', 'I loved the lambs', 'We worked with our friends to build a den'. 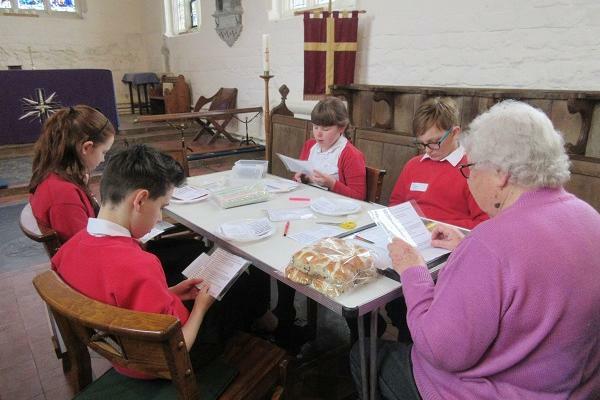 21st Mar - Pine class participated in REactive Church today, thanks to church volunteers. 21st Mar - Rev Felicity came into school again today to work with Rowan class in advance of the church service next week. 21st Mar - We welcomed GenR8 into school to explore the Easter story with the usual enthusiasm, drama and music. Our pupils said 'they made a song with actions which was really fun, we all joined in'. 20th - 21st Mar - Thank you to all those parents who attended our Parents' Evenings. We very much appreciate you taking the time to fill out our questionnaires and speak to Governors. Please do contact school if you have not yet arranged your appointment as this close home-school liaison is vital. 20th Mar - Puffins pupils were delighted to received their morse code certificate today thanks to our local Duxford Radio Society experts Peter, Martin and Eric. Puffins are very much looking forward to the 'advanced' session next. 20th Mar - Thank to Rev Felicity for supporting the pupils who led our collective worship today. 16th Mar - It is always a pleasure to hear about the learning successes of our pupils in the Headteachers' Awards assembly. 16th Mar - Rev. Felicity joined pupils to collaboratively plan our Lent church service which we hope you can join us at. The service is at 9:30am on Wednesday 28th March. 16th Mar - We were delighted to welcome Mrs Murfet into school to lead science activities with science club and two classes as part of British Science week. Exciting activities included lava lamps, George's marvelous medicine and rainbows! 16th Mar - Yew class participated in REactive Church today. Thank you to volunteers who make this possible. 14th Mar - Thank to Pine class and the school community for making the FOPS Pine cake sale such a fundraising success whilst enjoying tasty treats! 14th Mar - It was wonderful to welcome Mrs Bonfield back into school today to launch our handmade values bears. We are very grateful for her skill and time to make these for us. They are a beautiful replacement for the much loved values dolls which represented the old school values. 14th Mar - Rowan class attended the first of the REactive Church sessions as we prepare for Easter. 12th Mar - We were delighted to welcome Andy Richardson, from local business Volac, into school today to view Clicker7 and talk to the pupils about it. We are incredibly grateful to Volac for purchasing this fantastic educational software that can be used to support learning at home and school. 9th Mar - We were delighted to have so many mothers and female carers in school for lunch and Mother's Day activities. Pupils worked with their mums and grannies to make bridges, plaques, towers and also took part in a scavenger hunt! 9th Mar - In our Elm Class assembly, they shared their learning about Great Britain through artwork, oracy, music, songs and a wonderful retelling of the Feeding of the 5000 Bible story. 7th Mar - Pine Class walked up to Wimpole Hall Farm as part of their 'United Kingdom' topic focusing on their local area. Whilst there, they took part in an activity making butter in the Victorian dairy. 5th Mar - Mrs Grieves launched 'Malawi Monday' our fundraising challenge to cover her giant map of Malawi in donated coins. These funds will be taken to Malawi in August 2018 to continue the charity work of providing useable school building and resources for children to learn in. 2nd Mar - Thank you to the parents who braved the snowy weather to attend Headteachers Award Assembly. We were pleased the weather was such that we could keep the school open all week as the snow really came down at 3pm on Friday to start the weekend. One child thanked us for staying open! 28th Feb - For World Book Day, Helen Moss delivered workshops to all our pupils thanks to FOPS fundraising. Our pupils were inspired and one summed up the day by saying 'The author was really interesting. I learnt a lot and I even got a book!'. 28th Feb - Today we welcomed Andrew Reed, Director of Education for Ely Diocese, into school to celebrate the progress made against our Ofsted actions. The developing oracy skills and our inspired young writers were showcase by World Book Day. 23rd Feb - Thanks to FOPS and all those who attended the Petersfield Quiz. It was a very enjoyable night which raised much needed funds for the school! 23rd Feb - We were impressed by the half term learning which produced the homework challenge work. All pupils had the opportunity to talk about and show their varied creations during our celebration assembly today. Well done to all our children and their carers who obviously contributed to this. 21st Feb - We were delighted to welcome a member of the Ely Diocese team into school today as we again embark on Bishop Stephen's Lent Challenge. 19th Feb - Welcome back to school, open today for spring half term 2, to pupils, parents and visitors. 9th Feb - School is now closed for half term. We look forward to welcoming pupils, parents and visitors back to school on Monday 19th February. Happy Half Term! 9th Feb - Our Headteachers' Awards Collective Worship yet again showcased the talents of our pupils both with the live music and the awards to celebrate learning. 9th Feb - Congratulations to our Holland's cup winner today, who was awarded this because of her increased confidence to try out playing new pieces of music on the piano. 7th Feb - Thanks to the Post Office staff in Orwell who enabled Ash class to purchase their stamps as part of their project work. 6th Feb - Safer Internet Day. Pine class reported that 'In class, we thought about and discussed what emotions we'd feel if different things happened to us online and we created a 'wanted' poster for a good online friend.' Please do see the website for more information about staying safe online. 5th Feb - Well done to the KS2 pupils who represented Petersfield at the curling competition today. 2nd Feb - Year 5 and 6 visited Bassingbourn Village College to enjoy the dance show performed by the BVC pupils. This great opportunity inspired our pupils, illustrating what they can achieve when they reach secondary school. 1st Feb - We were delighted to be joined by many parents and friends to hear the beautiful singing of Petersfield's Young Voices Choir. They sang a selection of songs from those sung at the O2. They were truly inspirational! 31st Jan - Today was the 'Best School trip ever!' according to our pupils. We are so proud of our 'Young Voices' singers after their fabulous performance at the O2. 30th Jan - Congratulations to the Year 4 Maths Challenges teams who did a stunning job of representing Petersfield at St Faith's School. 26th Jan - Yew class led an inspirational assembly reporting back on what they had learnt at the Mental Heath conference in Cambridge. We learnt about mindfulness: we all sang together and played body percussion and discovered how concentrating on our breathing can help us relax! 19th Jan - Well done to our year 3 and 4 pupils who participated fully in Bikeability. They learnt new cycling skills, including safe cycling in cold weather. 19th Jan - School is OPEN today. All power and sanitation are now restored. 18th Jan - School is closed today as we still have no power, and crucially no running water. 12th Jan - Our year 6 pupils found the Mental Heath Conference very interesting with many new experiences: 'I learnt about mindfulness', 'It was amazing when we put a piece of music together and added a verse!'. 12th Jan - In our Headteachers Assembly today, we enjoyed listening to a pupil who was awarded The Hollands Cup for Music last term because of her beautiful singing voice. It was a delight and an inspiration for the pupils to hear how a voice can be used like an instrument. 8th Jan - Thank to the Molly Dancers for working with Elm and Pine class. Both classes performed the challenging dances well. This performance was really enjoyed by the rest of the school. 4th Jan - Happy New Year and welcome back to the spring term! What a positive start to learning for the term. Well done Petersfield! 3rd Jan - We look forward to welcoming back all our pupils, staff and visitors tomorrow, on Thursday 4th of January, for the start of the Spring term. 3rd Jan - Happy New Year! Today, for our INSET training day, all school staff and 2 of our governors were delighted to join Barrington and Foxton schools to launch our Talking Together project. 19th Dec - We wish you a very Merry Christmas as school closes today for the Christmas holiday. School will remain closed to pupils until we reopen on Thursday 4th of January (following an INSET training day for school staff on the 3rd of January). 19th Dec - What a fantastic way to end the autumn term with our Christmas parties and a visit from Father Christmas! 19th Dec - Thank you to Rev. Felicity for leading our Christmas nativity service at church. 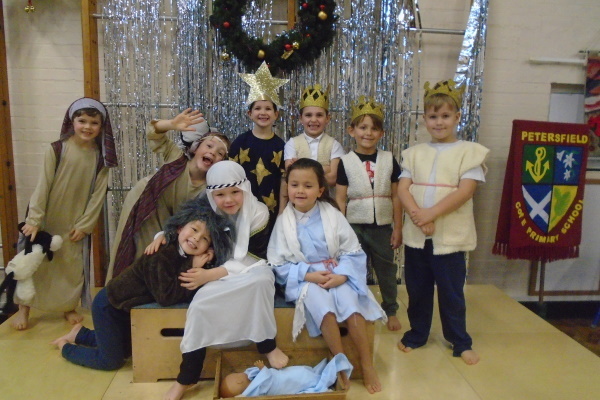 Our reception pupils acted out the Christmas story which was narrated by year 6. 18th Dec - Thanks to CCS for cooking Christmas dinner and to FOPS for supplying the crackers. What a festive meal, eaten as a school, on the penultimate day of term. 15th Dec - Congratulations to our Holland's Cup winner and all those who received certificates at the final Headteachers' awards of 2017. 14th and 15th Dec - What fabulous Christmas Production performances Ash and Elm class, well done! 13th Dec - Wow! The EYFS and KS1 Christmas Production Dress Rehearsal was stunning today. Lines, singing, dancing - what a performance from our younger pupils. Thanks to Mother Goose for enjoying this with us. 12th Dec - CANCELLED - it is with regret that we have cancelled tonight's Carols at Wimpole due to ice and sickness. 12th Dec - Thanks to Mrs Norie and our French club for their wonderful presentation in assembly. 11th Dec - Year 6 were delighted to be invited to the Methodist church to join in with rousing renditions of Christmas carols today. 12th Dec - Thanks to the Johnson Matthey team for analysising and presenting the results of the salt experiment in this afternoon's science session. 11th Dec - Thanks to our school staff and our local knight in shining armour (with his own snow shovel and energy! ), school is open for learning and all the paths are clear. 11th Dec - Snow update: 7:30am School is open. Please follow staff instruction about the route to enter school safely and bring coats, hats, gloves etc for outside. 9th Dec - After reflecting on the star in the nativity story, our contribution to the Methodist Tree Festival (thanks to a donation by Arrington Nurseries) was decorated with stars. 10th Dec - Thanks to Pine class for sharing their learning with pupils, parents and staff in their Class Assembly. 7th Dec - Our pupils were treated to a Panto paid for by FOPS (PTA). They laughed and joined in with the classics panto lines. After the panto, some classes had workshops learning more about the characters and ideas used in pantos. 6th Dec - Our children responded to the wonderful GenR8 assembly by saying: 'I learnt that Christmas is not just about presents, stockings and chocolates', 'It was good that the little ones can understand the true meaning of Christmas' and 'The puppets were great fun!'. 6th Dec - Pine class were the first class in KS2 to enjoy and learn from REactive church thanks to Rev. Felicity and the volunteers. 4th Dec - Today was a day of fabulous tales for each class as our Norfolk Children's Book Shop storyteller read extracts of interest to pupils. This was followed by a fabulous book fair which raised commission to buy some of these high quality books for our school. 1st Dec - At the Christmas Fair, there were many amazing things to purchase. The children enjoyed making secret gifts for their loved ones and a good time was had by all whilst making much-needed funds for the school. Thank you to FOPS committee for all their hard work. 1st Dec - The Christingle Service, held at St Andrews church, was beautiful; the light reflecting from the candle flames into the children's faces left us with a feeling of awe and wonder. 30th Nov - Thank you to the parents who joined us during the morning to make Christingles with their children. 29th Nov - Our school hosted Ed Williams, from Elite Swimming Academy, to talk in assembly about his recent solo swims across the English Channel, Gibraltar Straits and the Irish Channel. Ed spoke about the importance of courage, perseverance and resilience. 24th Nov - Exciting investigation today at the first science club lunchtime session. 24th Nov - Thanks to all the donations for the FOPS Christmas Fair on 'Non Uniform' day. 24th Nov - As it is Road Safety Week, we have been learning more about how to stay safe on the roads. Our pupils presented this message in a variety of ways, through posters, writing and our youngest pupils explained how to cross the roads safely. 22nd Nov - our 'Stay and Play' session at Peterfield welcomed prospective parents and pupils for September 2017. The application deadline for the first round of EYFS admissions is 15th January 2018. 22nd Nov - Pupils from Petersfield attended an award ceremony and were presented with our Bronze Travel Plan award and a prizes of bike and scooter storage. 21st Nov - Thanks to FOPS for the dancing, sweets and fun had at tonight's school disco. 17th Nov - The whole school dressed-down and dressed-up for Children In Need in return for giving a donation to this worthwhile charity. In assembly we learnt about how the money is raised and how it is spent. Our pupils reflected children who are not so fortunate. 16th Nov - We were delighted to host one of our regular induction sessions. We highly value the parent and local community support we receive to enrich the learning of our pupils. 16th Nov - In our Anti-Bullying Assembly today, we listened to how to be a good friend, why we are all unique, special and equal and the varieties of bullying. The pupils learnt more about how to deal with cyber bullying and we all agreed that Petersfield is an anti-bullying school. 14th Nov - Year 6 participated in the first of an exciting series of science lessons thanks to Johnson Matthey as organized by one of our wonderful parents. 14th Nov - we continue to invite parents and carers into school to find out more about how we support any specific needs of our pupils at our 'SENDCo parent drop in'. Please see the diary dates for the next session in the Spring term. 8th-14th Nov - Thank you to our teachers and FOPS for staffing the book fair and to our pupils and parents for supporting this event and grabbing a good read! 11th Nov - We were very proud of our pupils, past and present, who joined us and the local community to observe 2 minutes silence. Our thanks to Mr Bryant for organizing the poppy campaign at Petersfield and to the Standard Bearer who led us from school to Chequers. 10th Nov - Pine class enjoyed an excellent visit to the British Museum. Thanks to our staff and volunteers for enabling this visit. 10th Nov - Congratulation to those who deserved our Headteacher Awards today. We are very proud of the excellent learning and attitudes to learning being demonstrated. 9th Nov - We were delighted to welcome prospective parents to our Open Afternoon for September 2018 intake. We were very impressed with how the children joined in with the learning in class. We look forward to welcoming new pupils and parents back. The deadline for applications is 15th Jan 2018. 8th Nov - What an exciting medieval day in EYFS and KS1 today! Music, dancing, arts, crafts, cooking, and of course a banquet, were all enjoyed in costume. What a great day of learning! 6th Nov - Classes plan to plant their poppy seeds as we are proud to take part in the 'Ribbon of Poppies'. Together with scouts and guides, we have pledged to plant poppies whilst supporting the Royal British Legion this week. These seeds will grow by the centenary of the end of World War One. 6th Nov - Thank you to Mrs Grieves for her inspiring assembly about Malawi and her work there using the money we raised in the Summer term. 3rd Nov - THANK YOU! To Mr. Gwynn and his team; our FOPS and staff team; parents and pupils past, present and future; and the local community for a wonderful evening of fireworks, fun and food. 3rd Nov - Wow! What a Celebration of Learning for this term's homework. If you do not already have the next date in your diary - 9am 23rd Feb 2018 - please do save the date as the learning on display at these assemblies is very inspiring. 1st Nov - the FOPS committee met in preparation for the dazzling and incredible fireworks display planned for Friday night. Do come and join us at 6pm on Friday 3rd November for a spectacular display and a great evening of entertainment for all the family. 31st Oct - Welcome back to our pupils, parents and visitors for the first day of an exciting new half term of learning! 30th Oct - Teaching staff attended a packed and exciting day of INSET training in preparation for the new term. This training included Clicker 7 training. Thanks to an AMAZING donation from Volac, we are introducing Clicker7 - a literacy toolkit - to all our pupils. 20th Oct - School is now closed to pupils until we reopen for lessons first thing on Tuesday 31st October. Happy Half Term! 20th Oct - Congratulations to our Hollands' Cup winner of our music award this half term. 20th Oct - Our Black History Assembly focused on black authors. Parents, staff and pupils were inspired by the works of Trish Cook, Mallory Blackman, Pharrel Williams, Langston Hughes and Joseph Coelho, Our pupils spoke about their lives, read poems, sang, danced and showed us pieces of artwork. 19th Oct - We were delighted to be given the opportunity to say 'Thank you Vicar' to Revd. Felicity on Thursday afternoon. Our pupils thought carefully about the importance of her job and the variety of roles that she undertakes. They were able to tell her that she was special. 17th Oct - Thank you to the parents who joined us at Parents' Evening to discuss your child's strengths, progress, attainment and next steps. If you have not attended or booked an appointment, please do see your child's classteacher to arrange this essential meeting. 17th Oct - Well done to the year 6 pupils who represented us at the small school football competition today and did us proud! 13th Oct - Well done to Yew class for holding their delicious FOPS cake sale. 13th Oct - School Council discussed how to further improve lunch time in school with classes and a CCS representative. 13th Oct - Rowan class assembly showcased their learning and they sang 'Search for the Hero'. We were very proud! 12th Oct - Year 5 and 6 visited West Stow and learnt many facts to support their ongoing topic in a hands on, exciting way. 5th Oct - Each class voted for a Health and Safety Representative. During the meeting, we discussed their roles and what it means to be a Health and Safety Rep in school. Each class has a book to record anything that needs addressing. The pupils are taking their responsibility very seriously. 5th Oct - We were again delighted to welcome more of our EYFS parents into school for lunch today. 3rd Oct - Well done to our year 5 representatives who participated in the County English Challenge. We were very proud of their teamwork and knowledge. 3rd Oct - It was delightful to welcome Rev. Felicity and Mr Holland back into school this term for Collective Worship. 3rd Oct - We were delighted to welcome parents of our new reception pupils into school to share a school lunch with us. 3rd Oct - Year 6 visited Ely Cathedral with Barrington School and many other pupils from around the Diocese. 29th Sept - We have raised nearly £200 for Macmillan Cancer Support. Special thanks go to Mrs Seiler who helped organise this. It was wonderful to see so many members of the community and old and new parents enjoying a delicious cake, cuppa and chat! 29th Sept - We held a reflective, thoughtful harvest service led by Revd. Felicity in church. Our pupils gave thanks for the food we eat and donated produce for Jimmy's Night Shelter in Cambridge. They understand how lucky they are and how we need to remember those who are not so fortunate. 28th Sept - We welcomed Mrs MacFarlane from Cambridge Catering Service into school to talk about our Healthy Lifestyles project. 26th Sept - Today we welcomed Mr John Lucas, our Ofsted inspector, into school. 25th Sept - We look forward to welcoming Ofsted into school tomorrow. Parents, please do click on the link to Parentview at the bottom of the page to share your views about our wonderful school. 22nd Sept - Big smiles could be see as individual and family photos were taken to send home and to update our welcome entrance board. 21st Sept - Mrs Miller led our assembly providing an interesting report on the items discovered at last year's archeological dig at Petersfield and at other locations in the village. 21st Sept - Thank you to Barrington School for hosting the Parenting Course taster session. 20th Sept - We are delighted to have been awarded our Bronze level Modeshift STARS accreditation as a result of our Travel Plan. Our aim, through this work is ensure safe, healthy and active travelling to and around our school. 20th Sept - Today our collaboration partner Headteachers - Mrs Davies from Barrington and Mrs Davies from Foxton - joined us in school and commented on the wonderful learning environment, high quality display of our pupils' work and the calm behavior. 19th Sept - We welcomed a member of the County Attendance team into school to review our Attendance procedures. More information to follow, but please do keep an eye on new weekly monitoring of our whole school attendance figure in reception. 15th Sept - Well done to all our wonderful EYFS pupils who attended their first full day at Petersfield! 15th Sept - Congratulations to those children who were selected to receive the first Headteachers' Awards of 2017-18 thanks to their great attitude to learning so far this term. 13th Sept - We were delighted to welcome Ute, who runs our school Book Club, to Collective Worship to share her new book with us and donate a copy. See the 'Notice' section of the website to follow the link to her recent article in the Royston Crow which we feature in. 12th and 13th - Thanks to those parents who attended our Curriculum Evenings detailing the plans and routines for 2017-18. If you were unable to attend, please see Thursday's newsletter which lists the paperwork to be sent home. Also, please do arrange a time to speak to your child's classteacher. 12th - Want to try your hand a circus skills? We enjoyed a skillful demonstration in Collective Worship to launch our lunchtime club. 12th Sept - Spanish could be heard in KS2 as Spanish lessons, taught by language specialist Mrs Clover, started this week. 11th Sept - Our new sports coach taught all pupils PE for the first time today. Well done to everyone for participating with such enthusiasm. 11th Sept - Book clubs restarts at Petersfield. 11th Sept - Miss Smith and Mrs Penrose joined cluster schools in additional dyslexia friendly training. 7th Sept - Magical Maths and Premier Sports launched our 2017-18 after school club provision in assembly. 6th Sept - Despite it being the first day back, the PTA met to plan events and allocate funding to purchase equipment for school. We are especially pleased they will again be making a contribution to funding visits this year to facilitate our exciting curriculum. 6th Sept - Welcome back to pupils, parents, volunteers and visitors! It was lovely to see the excitement on the playground this morning. Welcome especially to our new pupils and parents. We are delighted with the behaviour, presentation and learning occurring in school this morning. Well done! 5th Sept - All staff participated in Behaviour INSET as we prepare to revise our behaviour policy in the Autumn term. 4th Sept - Our teachers are working and training in school today in preparation for welcoming our pupils back on Wednesday 6th September. 21st July - School is now closed to pupils for the summer holiday. We look forward to welcoming pupils, parents and visitors back to school on Wednesday 6th September. Have a wonderful summer holiday! 21st July - Today we celebrated the fantastic learning during 2016-17 as children returned to their old classes for the afternoon and we said good bye to pupils and staff who attended Petersfield for their last day. 20th July - Rowan's Got Talent! and they showed this to the whole school and their parents. 19th and 20th July - Our new reception children for September 2017 met Mrs Robichaud and visited our school to prepare for their exciting September school start. 19th July - Mrs Johnson introduced the Summer Reading Challenge - how much can you enjoy reading this summer? 19th and 20th July - Using their vast knowledge of Petersfield, our year 6 pupils produced a 'Transition Booklet' to support new parents and pupils who join our school. 19th-21st July - Our new transition arrangements were a huge success. We are now all prepared, ready and enthusiastic to start on the first day of the Autumn Term (6th Sept)! 18th July - The Year 6 Leavers' Assembly demonstrated perfectly why we are so, so proud of our year 6 pupils! 17th July - The Year 6 Tea Party speeches eloquently thanked all those who have enabled our wonderful year 6 pupils to be the successful, confident and social group that they are. 17th July - Our Church Service of Thanksgiving celebrated the success of 2016-17 and gave thanks for our wonderful year 6 pupils who were presented with a Bible each. 14th July - 'Oh I do like to be beside the seaside'...our seaside lunch took place whilst our gardening club worked hard to ensure we continue to grow our own produce! 13th July - The Full Governing Body (FGB) met in school to review the 16-17 academic year and continue to plan strategically for the 2017-18 school year. 13th July - Our French lunchtime club confidently shared their exciting language learning with pupils and parents in assembly today. 13th July - We are absolutely delighted to have been awarded the Silver School Games Mark award in recognition of our commitment, engagement and delivery of competitive school sport in 2016-17. 12th July - Thanks to all our parents, grandparents and Governors who joined us for our Open Afternoon and Certificate presentations today. 12th July - Rowan class reacted at REActive Church today. 11th July - Year 6 organised an exciting cross curricular morning of activities for the whole school. 'When can we do it again?' pupils asked after sessions including sport, drama, mapping skills, computing and art were thoroughly enjoyed. 10th July - Yew class celebrated their hard work and recent achievements with a visit to St Neots, practising their bowling skills and visiting Priory Park. 10th July - Ash and Elm participated in an exciting exploration of Hinchingbrooke Country Park which included a session pond dipping. 7th July - Today Hazel class participated in REActive church. This always gets our pupils thinking and asking questions! 6th and 7th July - Year 5 pupils enjoyed a taste of secondary school as they attended BVC. 6th July - Today it is the turn of our CVC year 6 pupils to attend the first of their 2 transition days which includes sports day. 6th July - Pine class were the first to learn from the KS2 REActive Church summer sessions which are planned over the next two weeks thanks to Rev. Felicity and church volunteers. 5th July - Mrs Peachey and Mrs Squires have begun the Home Visits to new reception pupils for 2017. We very much value the home school partnership which is essential to ensure all our pupils thrive. 5th July - Mrs Daw, Mrs Slator and Mrs Tovey received awards at the Governor Service 'Celebrating Success' Presentation Evening. This recognised their outstanding contribution to governance at Petersfield over many many years. 5th July 2017 - The final performance of Alice was a resounding success! What a musical extravaganza! 5th July - An exciting day of Science for our year 6 BVC pupils. This is the first of a series of planned transition days to support a smooth continuation of our pupils learning journey as they move to secondary school. 4th July 2017 - Thank you for all the wonderful comments about our amazing KS2 production performed this afternoon and evening. We are VERY proud of our school team - pupils, staff and volunteers who made these performance possible and so entertaining! 3rd July - 'Alice' at Petersfield - our KS2 pupils performed the dress rehearsal to KS1 and our visitors. What a delight and what catchy songs! 1st July - Thank you to our amazing PTA - today's Petersfest was a triumph and raised the huge amount of £1782.03! A stunning amount and much needed fundinging for the school. Thank you to all those who attended or worked tirelessly to supporting our school! 30th June - We now have our own 'hedgehog house' thanks to the Elm class project! 29th June - Cooperation and a competitive spirit were both evident during the buddy group activites and races at our well attended Sports Day. Our thanks go to Mrs Peachey for her planning and organization to ensure the event was a huge success. 23rd June - Our PTA AGM was attended by our dedicated committee and volunteers who raise such vital funds for the school. Please do ask any member of the PTA or ask at the school office if you can help with the upcoming events. 23rd June - The Music Marathon was an amazing event, the singing was truly beautiful and the musicians were inspiring. We were delighted to be joined by parents and members of the community. We hope to have raised a good amount of money for The Cambridge Cancer Help Centre. 22nd June - You really know it is the summer term when the Sports Day practices start. Our buddy groups, as ever, worked cooperatively before children had the chance to practice the competitive races. Please do join us for our Sports Day morning on the 29th of June if you can. 21st June - Our thanks to Jacquie McBride for leading the singing practice in preparation for our Music Marathon this Friday. Do join us on Friday afternoon if you can! 20th June - Despite the heat, our year 4s did us proud as they represented our school at the Mini Olympics competition, joining many other Cambridgeshire schools in this energetic and competitive day. 19th June - Don't forget school is closed to pupils for the Staff INSET training on Monday 19th June. We look forward to welcoming pupils, parents and visitors back to school at 8:45am on Tuesday 20th June for another busy and exciting week of learning. 16th June - Thank you to all the dads who were able to join us for Fathers' Day lunch and afternoon. The variety of fun activities including mint and lemonade based physics, gingerbread and collaborative 'three handed parcel wrapping' emphasized all our new school values in particular love.16th June - Thank you to all the dads who were able to join us for Fathers' Day lunch and afternoon. The variety of fun activities including mint and lemonade based physics, gingerbread and collaborative 'three handed parcel wrapping' emphasized all our new school values in particular love. 16th June - Wow! What a difference 1 gardening session has made to the Growzone thanks to the community volunteers and pupils who attended our first new Gardening Club. We look forward to reaping the rewards of the planting. 15th June - We were delighted to welcome our new reception parents for September 2017 to our 'New Parents' Evening' tonight. As ever, this evening was an exciting first step together in our new pupils' educational journey. 15th Jun - Mrs McBride inspired our pupils to sing in today's Collective Worship in preparation for next week's 24 hour music marathon. 14th June - Our thanks go to Ash class and our parent helpers for the PTA cake sale. The cakes looked and tasted delicious whilst raising money for school! 14th June - What wonderful smiles from all during our class photographs! 13th June - Thank you for supporting our Book Fair over the last week. Our pupils enjoyed browsing the selection of books perfect for avid readers. 12th June - 3 classes welcomed a specialist sports coach into school to improve their athletics skills. 12th June - Essential skills for road safety and cycling were being demonstrated by Yew and Rowan today at the start of this week's Bikeability training. 9th June - The website images provide just a flavour of the spectacular independent learning from the half term homework menu challenge. This learning was shared in Assembly today with parents, pupils and Governors. Governors then held the first of their new sessions to seek feedback from parents. 8th June - In Assembly, as a school, we discussed what a general election is, how this relates to British Values and democracy and prepared to vote for our school motto. 7th June - The first two of the specialist coaching sessions from our local tennis coach at the Orwell tennis courts, funded by the Sports premium, started today to encourage our children to enjoy more sports. We are very fortunate to have a fantastic tennis club and facilities on our doorstep. 5th June - Welcome back to a busy and exciting half term of learning. To start the term, as a school, we reflected on excellent learning behaviours and how we best care for the school environment. 15th - 26th May - We are delighted with how resilient and hard working our year 2s have been during the SATs weeks which are now complete. Despite the hot weather, they all worked through the papers with enthusiasm and smiles to the very end! 26th May - Our new Health and Safety Representatives joined staff and governors to discuss the importance of the role and conduct a site walk. They were so excited to take on the role and identified completed actions and next steps. 26th May - Our dear friend, Mr Hollands, presented the Hollands Cup for Musical Achievement to Jessamy. She had been nominated by our piano teacher for her enthusiasm and determination to challenge herself. 25th May - Our thanks go to Mrs Crafter for her science session with Rowan class. Our pupils were very enthusiastic and engaged scientists. 25th May - At our Elm class cake sale, those purchasing said 'the cakes were wonderful', Elm class reported that they 'enjoyed selling and eating them'! Thank you for supporting the PTA at this event. 25th May - Following the NSPCC workshops in school, our pupils said 'It was really helpful and reassuring' and 'I know that I can phone Childline if I have a worry'. 19th May - The School Council organised their whole school 'PJ run' to raise funds for school. We were delighted to welcome parents (described by our pupils as 'very supportive'). Parents said it was 'wonderful'! Our pupils said it was 'tricky', 'fun' and identified how they 'did not give up'. 18th May - Petersfield welcomed the NSPCC into school to support pupils to be confident to 'Speak Out, Stay Safe'. Pupils reported 'It really helped me' and 'I think Buddy was right to say those things'. 18th May - Year 5 also fielded a talented team of mathematicians for the Year 5 County Challenge - different competition and venue, same day! 18th May - Year 6 put forward a fantastic team for the 'Maths Challenge' competition. They enjoyed working as a team, rising to the challenge and meeting new people. 15th May - Much excitement was evident in school as the Swimming season started today. 14th May - Entertainment and amusement was had by all at the 'Pop Up' Circus organized by the PTA. The juggling clowns and the magician were particularly enjoyed! 12th May - Year 6 enjoyed a VERY well deserved 'post SATs picnic' before continuing with their learning for their last weeks at Petersfield. 8th - 11th May - We are SO proud of year 6 pupils. SATs demonstrate only one aspect of all the brilliant and talented pupils that we have in year 6 but they have all excelled in their attitude and effort of this element this week! 5th May - The pictures on the Pine Class webpage illustrate the amazing visit that inspired and educated our pupils as they continue to learn about the Rainforest. 3th May - Thank you to those parents who joined Mrs Peachey and Mrs Johnson for the phonics and reading workshop for parents. The presentation is now available on Ash and Elm class pages. 28th Apr - Ash class shared their 'pirate' learning in their class assembly through counting, facts and by walking the plank! We were especially proud of their confidence and clear voices. 26th - Our dedicated PTA members braved the cold to continue selling tickets to the fabulous 'Pop Up Circus' on the 14th May. Click on the link below (in the Notice Section) to find out more or catch them in the playground after school! 26th Apr - The Cambridge Picture Book shortlisted entries were introduced today ready for the grand vote next week! 25th Apr - Following our Kingswood meeting for parents and pupils, we look forward to the residential visit for year 5 and 6 next year. 19th Apr - We are very proud of the Year 5 and 6 Cross Country runners who represented our school in the County Competition. 18th Apr - Welcome back to the Summer Term at Petersfield as school reopens after Easter. 1st Apr - The school's outstanding 53 percent increase in funds raised to support the Royal British Legion, through the 2016 Poppy Appeal, was recognised at the award ceremony where Petersfield pupils received their certificate from the Lord Lieutenant. 31st Mar - School closes today for the Easter break. We look forward to welcoming pupils, parents and visitors back to school on Tuesday 18th April. 31st Mar - A beautiful reflective service at church to end our Spring term. Pupils, staff and parents considered the plight of refugees and then reflected and gave thanks for all our blessings. 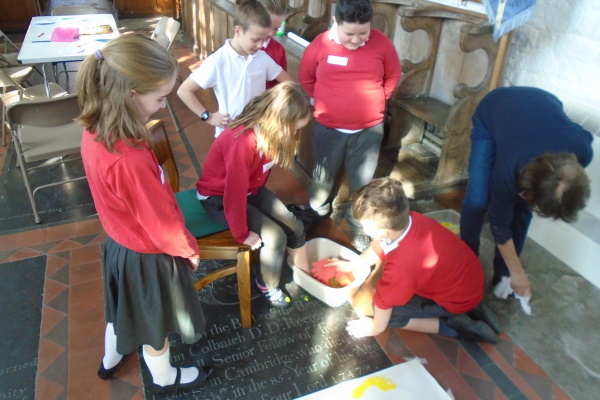 30th Mar - Hazel class were final KS2 class to attend Reactive Church over the last 2 weeks to reflect on the Easter story. 29th Mar - As well as scoring multiple tries as a class, one of our Hazel teams was awarded the 'Spirit of the Games' for their outstanding team ethic at the Tag Rugby competition. We are very proud! 27th Mar - Thank you for your support to raise money for school funds at the successful (and tasty!) Pine Class Cake Sale. 27th Mar - Ash and Elm class visit to Shuttleworth was described as 'Amazing'. 27th Mar - Hazel class enjoyed a hugely enjoyable and successful class visit to Tescos to summarise their learning this term. 24th Mar - Thanks to the wonderful Bikeability trainers, Hazel and Pine class learnt how to maintain their bikes, how to balance, about road safety and how to change gears. 24th Mar - We raised an impressive £118.00 for Comic Relief with our Dress Down Day. Pupils told their favourite jokes including: Knock, knock, who's there? Justin. Justin time for tea. What do you call a 3 legged donkey? A wonky. Why was 6 scared of 7? Because 7,8,9. 24th Mar - Congratulations to those who received certificates for taking part in the CAYAC(Cambs Area Young Artists) competition. Also congratulations to the winners of competition to dress up as characters for World Book Day who were awarded a book token. 23rd Mar - We were delighted to welcome 48 mums into school for our Mothers in School Lunch and Afternoon. Our mums had a lovely session including being serenaded in Collective Worship and creating water colour picture and constructing frames. Some of this art was given out in Church on Sunday. 22nd Mar - Thank you for the overwhelming support of the 'Fairer Funding' Consultation response. There is still time to write to your MP and sign our petition. 21st and 22nd Mar - We welcomed parents into school for Parent Teacher Consultations. We highly value this collaboration. 17th Mar - We are delighted that we now have a well established programme of pupils performing their musical talent at the start of Collective Worship on a Friday. 17th Mar - Congratulations to our Holland's Cup winner for their contribution to music at Petersfield. 14th Mar - As a school, we considered how we keep ourselves safe before Mr Carter introduced our new E-Safety policy. 10th Mar - 'Fantastic' commented one parent after Elm class shared their learning in their Class Assembly. 1st March - Personalised illustrations and messages from Matt were recorded in the popular after school book signing during which the children's World Book Day art work and illustrations were on display to parents. 1st March - Matt Long, author of Super Happy Magic Forest, was delighted with the participation of all our children and adults on World Book Day. After an assembly where we shared our book character costumes, we drew illustrations in class based sessions. 28th Feb - Delicious pancakes were made on Shrove Tuesday. 24th Feb - 'Outstanding' is the best description of the Homework presented by all year groups in Assembly. 20th Feb - Welcome back to Spring Half Term 2. The homework projects that are now being brought into school look interesting, colourful and exciting. We very much look forward to the learning we will be hearing about in the celebration assembly this week. 10th Feb - We were delighted to celebrate the Learning in Hazel class as they led our collective Worship. 9th Feb - We are delighted to announce that our new School Values - voted for by everyone who attended - are Friendship, Creation, Love, Peace and Trust. 8th Feb - As ever, our pupils rose spectacularly to the challenge and presented our 9 shortlisted values through dance, poetry, wordles, weaving, geography, drama, art, and outdoor activities. Everyone present voted for our new School Values to be announced tomorrow! 7th Feb - As part of their curriculum topic, Rowan and Yew class visited the Fitzwilliam Museum, which as ever was interesting, exciting and educational. 3rd Feb - Congratulation to our Holland's Music cup winner Ella! 2nd Feb - We raised over £150 for Allayance to fund essential playtherapy in our school thanks to the Non Uniform Day fundraising. 1st Feb - Petersfield's Proud Open Morning showcased maths, the resources we use and the calculation policy to parents. 1st Feb - Following a vote in Collective Worship for the final value as we had a tie, we have shortlisted our nine values in preparation for our Values Day on the 8th Feb.
31st Jan - We are incredibly proud of our year 4 team who entered the Maths Challenge at St Faith's school and came 20th out of 34 schools on their first entry. 27th - Our pupils and staff voted for the Values in the shortlisting activity in advance of our Values Day on 8th Feb. Parents, please do continue to return your votes. 27th - We were delighted to welcome so many parents into Pine class' presentation of their current curriculum topic food. Their ideas were presented through poetry, music and drama during Collective Worship. 26th Jan - The Antidiscrimination assembly, delivery by Mr Rome from Cambridge United, generated lots of ideas about how we can be more inclusive in sports. The children related this to our current Values consultation. 25th Jan - Hazel class welcomed Mrs Hollins to talk about the important work of Cambridge Food Bank as part of the curriculum topic 'food'. 20th Jan - Rowan class, who have been learning new programming skills thanks to the support of The Technology Partnership plc (TTP) and David Anderson, were filmed designing and making Lego 'frogs' move. 16th Jan - Xavier and James wrote an acrostic poem to celebrate this exciting sports opportunity for KS2. Archery, Right hand grip, Careful aiming, Hard pull back, Extra fun, Racing arrows, You must be sensible. 13th Jan - Congratulations to all those who took part in the recent Mathletics challenge! In our Headteacher award, we celebrated the successful maths work from the last month. 11th Jan - Cambridge United started this term's fun and energetic sessions. 9th Jan - Plough Monday, the first Monday after Epiphany, was marked at Petersfield by dancing thanks to the Molly Dancers who taught Rowan and Pine class two traditional dances. The demonstrations in assembly were very impressive! 6th Jan - We are delighted with the carefully considered contributions to our Christmas values task. All your thoughts and ideas will help as we work together to revise our school values this term. 5th Jan - Our youngest pupils demonstrated their 'Balancability' on the bikes today. 5th Jan - Well done to our pupils for the very positive start to Spring 2017. 4th Jan 2017 - Our new teaching team attended inspiring INSET training led by, our writing subject leader, Mr Ashford. 20th Dec - Thanks to parents for providing such a wonderful feast for our Christmas parties. Santa obviously agrees with our assessment that our pupils behaviour has been very good this year as Father Christmas visited each and every pupil. 20th Dec - Well done to our year R and 6 pupils for telling the Christmas story at church. The whole school carol singing was brilliant! Our thanks to Rev Felicity and Mr Hollands. Also to the Policemen who happened to be nearby who beautifully illustrated Ash class' 'People who help us' topic. 19th Dec - Christmas Dinner was a wonderful meal, shared with the whole school. Our thanks to our catering team, the PTA for the crackers and our pupils and staff who truly entered into the Christmas spirit! 16th Dec - As part of their 'Mountains' topic, we were delighted to welcome Mr Sutton into school to inspire Rowan and Ash class following his successful Three Peaks Challenge. 16th Dec - Congratulations to our Holland's cup winner, Felix, for his outstanding contribution to music at Petersfield during Autumn half term 2. Particularly impressive where his rhythm and creativity. 13th Dec - Carols and readings in the stable block at Wimpole. Our thanks to Mr and Mrs Williams, Wimpole Farm staff and our parents, governors, staff and pupils - past and present - for a fabulous evening. 13th, 14th and 15th Dec - We are SO proud of our EYFS and KS1 pupils who were amazing in their Dress Rehearsal and 2 performances. The singing, acting and dancing were fantastic as they told the Christmas story in the 'Sleep Shepherd'. 12th Dec - Year 6 were delighted to be invited to join the local community singing carols at the Methodist Church. 9th Dec - Rowan class assembly was very thought provoking and inspiring. 6th Dec - Dancing, light sticks and fun at the PTA School Disco, thanks to Will (our DJ) and the dedicated group of PTA parents and our school staff! 6th Dec - The first of our KS2 classes were offsite to participate in REActive Church. Thanks to Rev. Felicity and her volunteers for these exciting and thought provoking 4 sessions for KS2 before Christmas. 2nd Dec - Thanks to all the Parent Teachers Association (PTA) members for the Christmas Fayre. Money was raised for school funds whilst as providing fun and Christmas gifts. Pupils reported 'I liked the Year 6 games...there were lots' and 'I liked running the stall so other people can join in'. 2nd Dec - Christingle service at church. This is always an event that inspires awe and wonder. Pupils said 'I liked blowing out the candles', 'I really enjoyed singing the Christingle songs' and 'It is very important that we have Christingle as it refreshes our minds about Christ and God'. 1st Dec - Decorations Day at Petersfield. Our pupils said 'It's great having your mum or dad in to share the fun' and 'It was enjoyable making the Christingle'. Thanks to all the parents who joined us and helped make Petersfield festive. 29th Nov - At the Cross Country there were over a 1000 children competing and we are very proud of all the children who took part. They all tried their very best and had a great time. We even had some super finishing positions with children from Petersfield finishing in 5th, 9th and 10th. 25th Nov - Road Safety Week and Assembly: Ash class learnt how to cross the road safely and sang about safety. Elm class produced road safety posters. Hazel class used verbs connected with road safety. Pine role played and wrote instructions. Rowan class wrote poems and Yew class held a debate. 21st Nov - The GenR8 team led our Collective Worship. As ever, GenR8 captured pupils attention with their songs, waves and stories and left pupils to reflect on the message. 18th Nov - Our Anti-bullying week culminated in an assembly which delivered a powerful message from all our classes and the School Council about being a good friend, the effect of exclusion and unkind words and strategies for preventing bullying in the form of talks, pictures, role play and posters. 18th Nov - Fundraising for Children in Need at Petersfield. 16th Nov - A group of year 4 and 5 children were trained as 'play leaders'. This will mean they can run activities for children in KS1 at playtime and lunchtime. 15th Nov - We were very proud of the children in Years 4 and 5 who took part in the Small Schools Tag Rugby competition. They had a great time and played really well as part of a team against some much older and more experienced teams. For some of our team this was their first competitive event. 11th Nov - Pupils (with their created poppies) and staff joined Bob Bryant (British Legion) and the Standard Bearer in school to reflect on Armistice. Year 6 represented Petersfield in the village as the whole school observed the silence at 11am. 4th Nov - Thanks to the amazing work of our PTA and the spectacular fireworks display provided by Steve, we raised lots of money to support our school whilst having a thoroughly good time! Thanks to pupils and parents (past and present) and members of our local community who enjoyed this with us. 4th Nov - 'Phenomenal' was the best description we heard to sum up the homework celebrated at our sharing assembly. From volcanoes, to bats in a box and stone age tools - what fantastic half term challenges. 31st Oct - Our teachers joined other cluster schools on our INSET day to learn about 'Write Away' designed to help improve all pupils' writing. 21st Oct - Stand Up to Cancer Day raised over £900 on the day - do please visit our Just Giving page to donate. Pupils had wacky hair, dressed down, sold cakes and enjoyed being the teacher. Pupil comments included a plan to be strict and a question for teachers 'How do you manage it?!'. 21st Oct - We are very proud of Ben who was awarded the Holland's Music cup for his enthusiasm and self motivation. He is a role model to others as he is always practising and keen to improve. 18th Oct - Congratulations to our year 5-6 football team for their excellent team spirit in the cluster competition. 7th was a great achievement and the first game was won 5-0 despite the heavy rain! 17th and 18th Oct - Parents' Evening at Petersfield with the opportunity for parents to have a sneak preview of the stunning whole school poppy Remembrance display. 17th Oct - We are incredibly proud that Petersfield was represented on the successful Cambridge United Under 11s Latvia Tour, the first of the season starting with a tournament win. 12th Oct - Following a visit last week from a tortoise, Elm class welcomed a pet snake into school as part of their snake topic. Many thanks to the pet owners for such an interesting visit. 11th Oct - We were delighted to share in the excitement and enthusiasm of our returning year 6 pupils who learnt about Christian Aid at the Ely Cathedral Day. 5th Oct - Congratulations to our 'Gobblefunk' Roald Dahl Day fabulous words winners announced in assembly today. 3rd-5th Oct - Today we welcomed our first new reception parents to share lunch with us. Well done to our Mums, Dads and pupils who received clean plate stickers! We appreciate the comments reflecting how much you enjoyed the event and look forward to the next parent lunch on Decorations Day. 30th Sept - We were delighted to welcome members of the school and local community to our Macmillan Fundraising Coffee Morning (raising £140) and our 'Petersfield's Proud' Internet Safety and Art showcase. 30th Sept - Our first Headteacher Awards of Autumn 2016 (with our Celebration Collective Worship now being led by our Year 6 pupils) recognised the work and learning behaviours we are most proud of. Please see our weekly 'Petersfield Press' for more information. 28th Sept - CONGRATUATIONS! To our first Writers of the Week: Alice, Emma, Nicolas, Noah, Thomas, Liam. Please visit Mr. Ashford's class page to find out more. 27th Sept - Rowan and Yew class explored Chapel Orchard as part of their science topic work. 23rd Sept - Our Service of Thanksgiving reflected on our many uses of water. The preserved food was donated to the Jimmy's Night Shelter whilst money was raised to go to All We Can - helping to provide clean water in Uganda and other countries. 22nd Sept - Our PTA AGM demonstrated that we are incredibly lucky to have a small but dedicated and enthusiastic PTA team who raised £1000s last year for our school library. If you would like to get involved, please do ask at the school office for more information. 22nd Sept - Thank you to our volunteers who attended induction. 13th and 14th Sept - We welcomed a significant number of our parents to our Curriculum Evenings to hear about the timetables, curriculum, homework, Learning Links and very high expectations for 2016-17. If you missed these evenings, please see your child's classteachers to find out more. 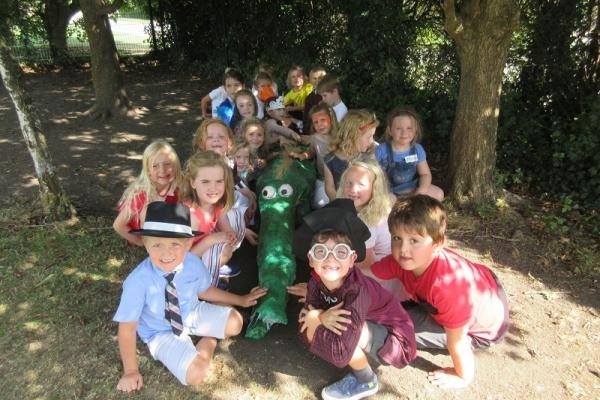 13th Sept - Watch out for the ENORMOUS crocodile lurking in school, made by our pupils as just part of our Roald Dahl day. 6th Sept - Governors attended the first FGB meeting of 2016-17 to plan the strategic direction of Petersfield. Do you have the skills and enthusiasm to join our Governing Body? 5th Sept - We are incredibly proud of our pupils for their very positive attitude to learning on the first day of the 2016-17 school year. 21st July - Time to say a final goodbye to staff and pupils who are leaving us this year as we looked forward to and exciting new academic year in September. 20th July - Rowan classes considered how to stay safe during their drama day. 19th July - Our fabulous year 6 showed us just why we are so, so proud of them as they produced their final, Oscars inspired, Leavers' Assembly. Good luck year 6! 18th July - Our Leavers' Thanksgiving Service led by Reverend Felicity and our pupils. 14th July - Pine class at Reactive Church. 12th July - Great fun and fantastic dancing, thanks to the splendid organisation by the PTA and our fantastic DJ Will, at the Summer Disco. 11th July - We were delighted to welcome parents and grandparents into school to read together, celebrate progress shown in books and enjoy the presentation of swimming, Mathletics and Bikeability certificates. 8th July - Ash class got up close and personal with a variety of animals at Paradise Wildlife Park. 7th and 8th July - Year 5 enjoyed curriculum days at BVC. 6th July - Year 6 visited BVC for 'Move up Day'. 5th and 6th July - A member of the audience reported that the KS2 production was the best school play they had ever seen - it got better and better each performance. 4th July - Wow! Porridge, our KS2 production, dress rehearsal was a real success with lights, fabulous understudies and fantastic singing! 28th June - Hazel and Pine pupils are super scientists at the Science Museum in London. 25th June - races, games, stalls, a raffle, face painting, a BBQ, a wonderful atmosphere, lots of fun and much, much more at our fabulous PTA Summer Fayre fundraiser. Thank you to everyone who helped and everyone who attended. 24th June - Well done to everyone who took part in Sports Day and thank you so much to our school community for the fantastic support. This year, our deserving winning team were Green team! 23rd June - Pine and Hazel's turn to visit Wimpole. 22nd June - We are very proud of our Year 5 representatives who participated in 'Mathsfest' with local cluster schools. Wednesday 22nd June - Elm and Ash classes explored the Capability Brown installations in the ground of Wimpole despite the variable weather. 16th June - Petersfield Archaeological Dig found a possible piece of medieval pot. 13th June - GenR8 led our Collective Worship. 13th June - Bikeability was enjoyed by year 5 and 6 despite the rain! 10th June - Petersfield's Proud showcased the wonderful and varied project work from this term's Home Learning project to pupils and parents. 10th June - Our school community dressed in red, white and blue and enjoyed a picnic lunch as we celebrated the Queen's birthday. 10th June - Sue Miller outlined the exciting plans for the 'Petersfield Dig' to the whole school. 7th June - Learning about photosynthesis, plants, trees and flowers and making leaves out of clay were just a few of the exciting and challenging learning opportunities enjoyed by Elm class at Stibbington. 25th May - Rowan and Yew classes were inspired by Scene: a new way of looking - celebrating the 300th anniversary of the birth of Capability Brown - whilst visiting Wimpole Hall. 19th May - Year 5 girls initiated, planned, baked and raised an amazing £79 from the cake sale for our school. Wow! 13th May - Well done Elm class for raising over seventy pounds for the PTA whilst providing the school community with delicious cakes. 9th May - We are incredibly proud of our Year 6 pupils who started SATs week by maintaining their hardworking,calm and confident attitude through the Reading SAT. 5th May - Our reception pupils enjoy Forest School activities. 3rd May - Our School Council raised funds to plant the front entrance flower beds according to their design with their successful teddy bear sale. 29th April - Our second successful PTA Friday Cafe was well attended. Thank you for supporting fundraising for our school. 22nd April - Ash class shared their spectacular learning and led Friday's Collective Worship. 20th April - Even higher expectations are agreed as pupils and staff implement the new presentation standards and Marking and Feedback Policy. 18th April - First day back for the Summer Term and pupils are treated to a sight of the engines moving. 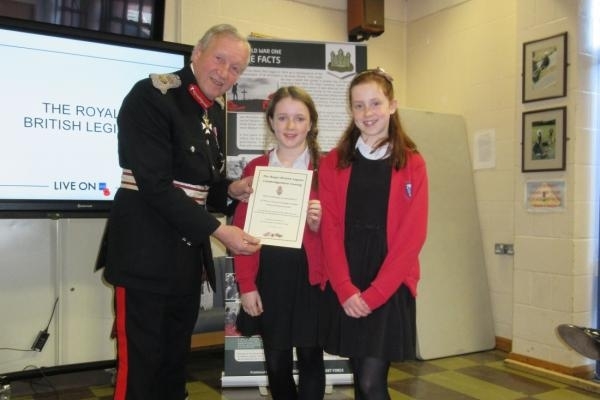 2nd April - Pupils receive the award from the Lord Lieutenant in recognition of our fundraising for the British Legion. 23rd March - Easter Service at St Andrew, Orwell. We all built a whole school cairn in the graveyard before the service. 21st March - We were delighted to welcome so many parents into school for Parents' Evening, continuing our close working partnership. 18th March - Whole school fundraising and fitness at the Sports Relief Challenge. 15th March - Delightful treats and fundraising at the Hazel PTA cake sale. 11th March - Hazel class lead our Collective Worship and shared their learning this term. 8th March - Fantastic fun and fabulous fundraising at the PTA Chocolate Bingo. 4th March - A morning of Mothers' Day activities and a shared lunch. 3rd March - Staff and pupils shared books and dressed as their favourite character for World Book Day. 26th February - Wow! What a fantastic display of Home Learning in our sharing assembly. 11th February - We welcomed Mr Lancaster to school for our SIAMS Church School Inspection. 10th February - Mrs Gwynn and Mrs Penrose were delighted to be appointed as Co-Headteachers of Petersfield. 3rd February - Parents and Governors were invited into school to see our work on SMSC, British Values and E-Safety.